Ronda Rousey is struggling to come to terms with the defeat to Holly Holm at UFC 193. If fighting really is 90 per cent mental and 10 per cent technique, then perhaps Ronda Rousey would be wise to consider her UFC future. The former bantamweight queen displayed incredible bravery in describing the depths of her despair after being dethroned by Holly Holm at UFC 193 in November. But what was clear from the raw and emotionally-charged interview with Ellen DeGeneres last week is that she is struggling to rebuild from the rubble of her collapsed sovereignty. And it was unsettling to see. Here, was a once-in-a-generation fighter and one of the most dominant champions the sport of MMA has ever known, exposing her vulnerability and choking back the tears. During the interview, she imparted that she considered suicidal thoughts in the immediate aftermath of the Holm bludgeoning. But what do we take from this? Having suffered the first defeat of her MMA career in a fight millions – including herself – expected her to win, is this mind-set to be expected? Or is this an indication of something much more concerning? There are a lot of things to consider, both from a psychological perspective and a physical standpoint. Ever since her Octagon debut in 2013, the UFC has painted a picture of Rousey as an indomitable force. They have never missed an opportunity to ram home the idea she was essentially superhuman and likewise, neither did she. And for a time, we all revelled in that. After all, ‘Rowdy’ didn’t just beat her opponents, she annihilated them. Talk of retirement surfaced because it seemed no one would be able to dislodge her. Then Holm shattered that veil of invincibility in emphatic fashion, making her look human and levelling the legend with a kick to the head. Had the interview on ‘Ellen’ been in December then it’s possible her such thoughts wouldn’t be so outrageous. But we’re four months on from the loss. How can she be expected to rematch Holm this year after such an admission? And when her schedule is packed with obligations between now and at least May. We’re only seven weeks into 2016 and she’s already adorned the front cover of Sports Illustrated, hosted ‘Saturday Night Live’ and appeared on ‘The Tonight Show’. She has acting roles in ‘Mile 22’ and the ‘Road House’ to come all before she even steps foot into the gym. Does that give her the necessary time to work on the technical deficiencies Holm emphatically exposed? Every day she spends away from training is a step further behind and defeat again could leave a wound no amount of time can heal. Fight Club: Who stands in Anderson SIlva's way? Then factor in the blow itself. The kind of knockout she was dealt takes a long time recover from. Yes, she looked good on that SI front cover but no amount of body paint can cover up the far-reaching effects of that impact. She said so herself: “I really don’t remember most of it.’’ Given her commitments outside the Octagon, it’s clear she no longer needs the UFC. Hanging up her gloves is certainly something to consider and even if she does decide to return, Rousey should be given all the time and support she needs because at the moment, she’s fighting a battle every day, and that’s even before she meets Holm again. There was no bad blood between the pair who will meet on Monday morning at 6am GST. Billed Cowboy vs Cowboy, the event is the second time UFC Fight Night has rolled into Pittsburgh. Use #360fans to share with us your thoughts on the fight with both predictions and reaction to all the events on the night. The UK’s posterboy for MMA is hoping to use Silva as a platform to finally land a title shot. Michael Bisping has every right to be bitter. About being defeated, as it now transpires, in three UFC title eliminators by drug cheats; or an injury layoff coinciding with an upward curve in the popularity of Mixed Martial Arts (MMA) in Europe. You wouldn’t begrudge him, too, for looking at his next challenge with a tinge of resentment, as he faces the man he always dreamed of ripping the UFC middleweight belt from, without gold on the line. Yet, when you bring these topics to his attention, there is no acerbity, just determination. On February 27, at London’s 02 Arena, ‘The Count’ takes on arguably the greatest fighter to have ever prowled the Octagon in Brazil’s Anderson Silva. It’s a bout that should the United Kingdom’s MMA posterboy win, could finally see him contest for the 185lbs crown after an eight-year campaign to do so. He’s been close before, though. The ‘TRT Generation’, or fighters who have served bans relating to performance-enhancing drugs, hallmark the defeats he suffered in the 11th hour of his title pursuits. Dan Henderson, Chael Sonnen and Vitor Belfort all brought efforts to an end. But despite the setbacks, Bisping has remarkably never left the title conversation since joining the division back in 2008. “I’m proud of that,” Bisping tells Sport360 when asked about making several comebacks. “People may get to that No1 contenders spot once in their life and then that’s them done. I’m now about to fight for the 33rd time in the UFC and I’ve always been in the picture. “Of course, everytime I’ve fought for that top spot it’s been against guys who have been caught cheating. But whatever, it’s done now and I lost those fights. It would be disappointing to look back on if I don’t get the belt but at the same time you can’t be bitter about it. “The fights happened and you’ve just got to get on with it. That’s why I’m training so hard now to get another opportunity at a title shot. Indeed, Bisping has to had to grind to return to the elite end of the division. At the backend of 2014, current champion Luke Rockhold provided a significant stumbling block with a second-round submission victory over the Brit. But fast-forward just over 12 months and the 36-year-old finds himself on a two-fight win streak. Making it three, though, will be the toughest of his career. Silva, who is returning to the Octagon after a 12-month PED suspension, holds the longest title streak in UFC history. Chris Weidman brought that 2,457 day run to a shuddering halt three years ago and since then the Brazilian icon has fought just twice: breaking his leg in the rematch with Weidman before returning to beat Nick Diaz in January 2015. ‘The Spider’ failed multiple drug tests after that fight citing “sexual performance” medication for tainting his test results. 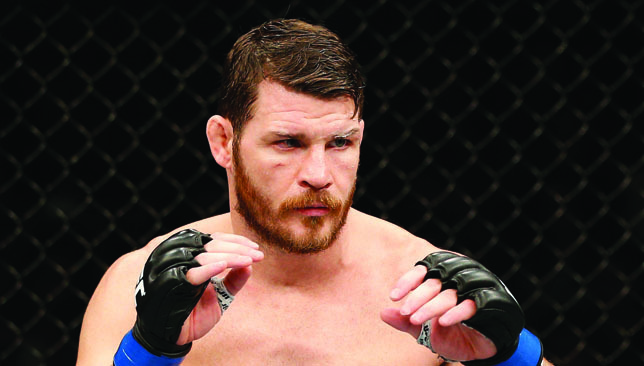 Bisping sees that differently and is confidence of defeating the 40-year-old. “I think he was on steroids his whole career,” the Manchester fighter adds. “The Nick Diaz fight was the first time he fought when testing was introduced and wouldn’t you know it, he tested positive. “But to me I thought he was on it his whole career and you look at that fight he didn’t look great. I’ve always thought I could beat Anderson and I certainly think it now. The dream was to always beat him to be world champion. “Yes, you could say it’s bittersweet he no longer holds the belt but I’ve always wanted this fight and I’ve always thought I could beat him. He’s great at certain things but he’s not as great as what people think. “Yeah, okay, he’s accurate and he’s very inventive but he’s not the best wrestler, he’s not the best on the ground, he’s not that fast and he’s not the best boxer. He’s got some good kicks, knees and elbows but I’m long enough in the tooth to avoid the danger. Bisping’s confident declaration is given extra credence when you examine his record on home soil. The UFC returns to London after a two-year absence, however, Bisping returned to his UK stomping ground last July when he picked up a crucial split decision win over the resurgent Thales Leites in Glasgow. In doing so, he extended an unbeaten streak on home soil to 17-0 in professional outings. And it’s a statistic all the more remarkable when you consider the almost immeasurable pressure that has rested heavily on his shoulders. The UK has a rich history in producing top level combat sports athletes, with boxing and kickboxing prominent. But the successes there did not initially translate to MMA. That was until the searing rise of Bisping. He won Season Three of the Ultimate Fighter where his trash talking, loud mouthed demeanour and fast paced, all action fighting style would see him garner both fan support from the UK and Europe, and fan hatred throughout the US. He built his stardom with the mic in his hand and legitimate, world-class fighting ability, which encouraged the UFC to use Bisping to break into the UK market. So how has he dealt with being the face of British MMA as he prepares to return to London? “I hear people say that but I never thought that about myself,” Bisping says. Of course, the pressure will be at it’s most intense next Saturday and given Bisping turns 37 the day after it will only add to that. His response? Don’t count Bisping out just yet, because everytime he is down and out he comes back stronger. And beating Silva will finally lead him down a path to gold.